The most incriminatory and unarguable allegation leveled by some Senate Judiciary Committee panelists against Supreme Court nominee Judge Neil Gorsuch was, apparently, that he isn’t Merrick Garland. Guilty as charged. Mr. Garland, of course, for anyone blessedly short of political memory, was former President Barack Obama’s nominee for the seat left vacant since the death of Justice Antonin Scalia in February, 2016. Republican senators refused to schedule a hearing for that nominee since, they argued, a new president would be inaugurated a mere ten months later. In this observer’s mind, and entirely unrelated to either my feelings about Mr. Obama or the fact that Judge Garland is Jewish, that refusal was a failure of congressional conscience. No matter how lame a presidential duck may be (and ten months is a substantial amount of time for a waterfowl to limp about), a sitting president has a right to nominate a candidate for a vacant Supreme Court seat; and the legislative branch, a responsibility to fairly consider him. But the fact that something unconscionable was done cannot change reality. Bad things happen (or are wrought), but life must go on. Mr. Garland’s mistreatment does not implicate Mr. Gorsuch in any way. 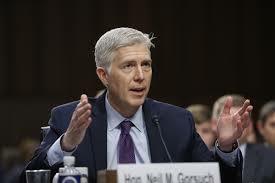 And the latter, as per his reputation and his thoughtful responses during the Senate Judiciary Committee hearings, is an individual eminently qualified to serve on the nation’s highest court. Less incriminatory, and entirely arguable, were two other charges brought against the nominee: that he once made remarks disparaging to expectant mothers, and that he showed callous misjudgment in a fraught legal case, ruling for an employer against an employee. In the first case, a former law student of Judge Gorsuch alleged that, in a course at the University of Colorado Law School last year, he told his class that employers, specifically law firms, should ask women seeking jobs about their plans for establishing a family, and implied that women routinely manipulate companies when they are interviewed, in order to extract maternity benefits. The second attempt to portray Mr. Gorsuch as an ogre involved the case of a truck driver who was fired for abandoning his cargo trailer when its brakes froze in sub-zero temperatures. The unfortunate man, after repeatedly being told by the company to stay put since help was on the way, decided – entirely understandably, considering the temperature and the malfunctioning of the heater in the truck cab – to detach the trailer from the cab and drive away. The legal question in the case was whether a “whistleblower” provision that protects a driver when he “refuses to operate a vehicle” because of safety concerns covered the trucker who chose instead to operate his vehicle. It may have been heartless for the employer to fire the trucker, in other words, but did it violate the letter of the statute? Judge Gorsuch, in a dissent to a 2016 ruling by his two colleagues on a three-judge panel of the U.S. Court of Appeals for the Tenth Circuit, contended that it did not. For that stance, the nominee was painted as heartless himself, unconcerned with the “little guy.” But an American judge, of course, no less than, l’havdil, a posek in a monetary issue, must render his dispassionate judgment, devoid of sympathy or antipathy toward either litigant, “big company” or “little guy.” The Torah enjoins us to not “favor the face of the poor one” in court (Vayikra, 19:15). In 97 percent of 2,700 cases, Mr. Gorsuch noted, his judgments were part of unanimous decisions; and he was in the majority 99 percent of the time. No, he’s not Merrick Garland, it must be conceded. He is Neil Gorsuch. And eminently qualified for a seat on the republic’s highest court. This entry was posted in Jewish Thought, News, Personalities, Politics on March 30, 2017 by Rabbi Avi Shafran. If you found anything you read here stimulating, interesting, share-able or infuriating (i.e. thought-provoking) and want to register your appreciation and support this site with a gratuity, please click here.